Sunday's Detroit Free Press ran a cover story detailing how social media is being used by religious leaders. In his article "What Would Jesus Tweet?," religion editor Niraj Warikoo looks at how houses of worship are using Facebook and Twitter to reach out to its membership and potential members. He writes, "Religious groups are increasingly trying to harness the power of social media -- from a Pentecostal church in Canton using Facebook to reel in new members to a Catholic priest in Plymouth [Michigan] who uploads podcasts of sermons to an Oak Park rabbi sparking national debates on his blog. And with its own particular rules and rituals, the world of social media has become, in a way, its own religion." Interviewed for the article, I explained, "The fact that I can disseminate my Torah, my Jewish wisdom, to so many people is a modern miracle of sorts." The article ties in well to the current Jewish month of Elul when Jews around the world are pledging to improve in the coming new year and offering repentance to those we've wronged. Miller argues that during the high holidays -- a time when Jews are called upon to repent and seek forgiveness from those they've wronged in the past year -- it's inappropriate for people to apologize through Facebook or Twitter. And posting on Facebook isn't the best way to convey your condolences to a close friend who has lost a loved one, he says. Jews have long had religious laws that today have implications for social media. 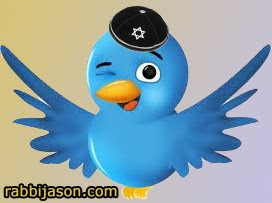 They include rules that prohibit inappropriate slander such as motzi shem ra, which refers to spreading malicious lies that harm a person's name.